3 Workplace Inefficiencies That Can Negatively Affect Your Business | TimeMachines Inc.
Company inefficiencies can range from minor distractors to full-blown financial disasters. If you’re overseeing a business, no matter what industry you’re involved in, it’s imperative that you do everything you can to keep your workers focused and productive — and cutting down companywide inefficiencies is a great way to start. 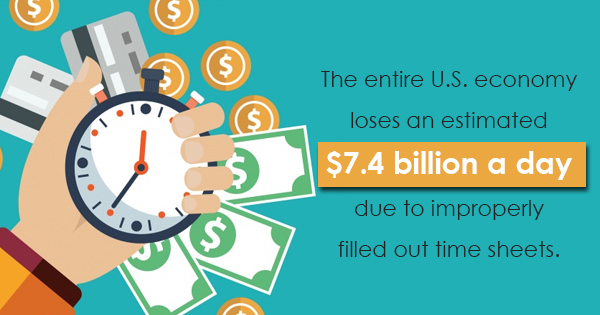 Improperly filled out time sheets — The entire U.S. economy loses an estimated $7.4 billion a day due to improperly filled out time sheets. That equates to roughly 50 million hours a day. Your best bet is to find a digitized time sheet service so you can ensure accurate punches and that no one is taking advantage of filling out their own time sheets. Unsynchronized network time — If your business isn’t operating on the same timeframe, there are going to be plenty of errors across your company. Luckily, there are network clocks that can help everyone get on the same accurate and synchronized timeframe in order to maximize efficiency and avoid time-related issues. From WiFi digital clocks to network clocks on each wall of your business, this is a great way to improve your company’s productivity and limit errors. You can even have WiFi digital wall clocks synchronized to your network for remote workers or other buildings you have anywhere in the country. Not streamlining essential communications — In most companies, when a problem happens, one employee has to report to another, who then reports to another, who then emails their manager, who finally reports to his or her superior. That doesn’t sound all that efficient. There needs to be an open line of communication across your business so every employee can feel heard and so that problems can be addressed immediately. Make sure your company is running as efficiently as possible throughout each workday. If you want to find out more about network clocks or check out our quality network Time Machine products, give Time Machines a call today.